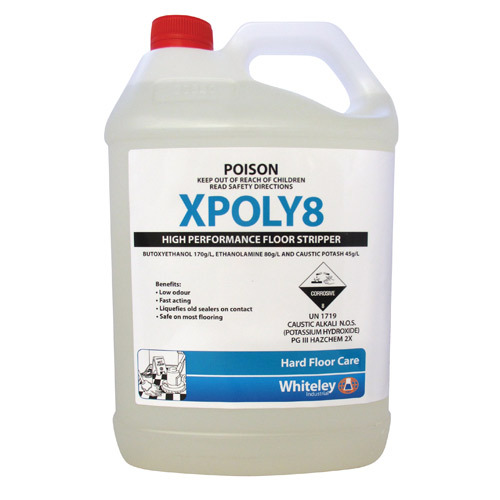 Xpoly8 High Performance Floor Stripper is a low odour, fast acting and labour saving method for removing floor sealers/finishes with a minimum of scrubbing. It is a new generation high performance floor stripper designed to rapidly liquefy and emulsify old sealers for easy removal with an auto-scrubber or mop and bucket. It is a powerful dual action floor stripper designed to remove metalised and non-metalised floor finishes. This floor stripper is available in 5L bottles. Xpoly8 contains a blend of glycol solvents that synergise with a rapid penetration dual chain emulsifier to penetrate the most stubborn old polish films. Xpoly8 can be used on vinyl, vinyl asbestos, rubber, no-wax linoleum, lino tile, marble, terrazzo, ceramic quarry tiles and most types of flooring. minutes, being sure to keep the floor wet. Floor will be slippery when it’s wet. Scrub the floor using a black pad. Pick up the dissolved sealer. Rinse the floor with clean water and allow the floor to dry. Avoid prolonged contact with metal surfaces.